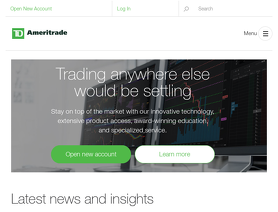 TD Ameritrade.com and Scottrade.com have joined together. Other websites of this company include Ameritrade.com. TDAmeriTrade.com is an online stock trading broker. TD Ameri Trade offers online trading platform. TDAmeriTrade offers stocks, options, ETFs, Mutual Funds, futures, forex etc. for your personal investment and trading options. Laurent J. La Brie, and individual investor, filed a Civil Case #: 0804-0021814-2010 in the Maryland District Court of Towson, Maryland for damages in the amount of $ 15,573.94 ($15,173.94 investment losses and $400 legal charges) and punitive damages for the intentional conduct deliberately directed against La Brie for the benefit of TDAmeritrade. 1. The agreement between Plaintiff and TDA is that all options in the money by more than 1 cent should be exercised. 2. On December 5, Plaintiff was told by a TDA "options expert"